A Miko is a maiden, who conducts ceremonies to worship gods at a shrine. 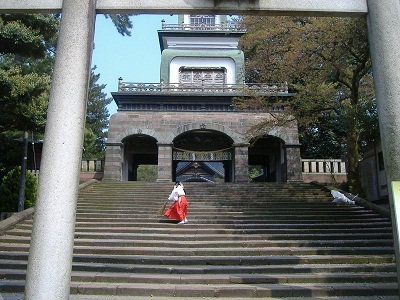 A Miko wearing red and white costumes was sweeping the stone steps of Shinmon gate, which is designated as a national important cultural property. The stained glass windows installed on the third floor resemble Dutch design. 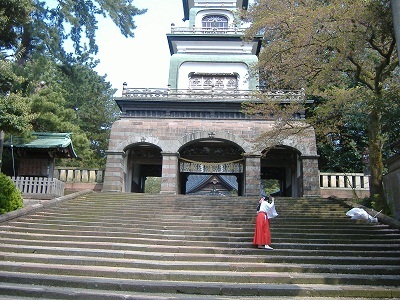 Oyama-jinja shrine was first built in 1599. Nowadays the shrine dedicates the soul of the founder of Kaga clan, Toshiie Maeda.